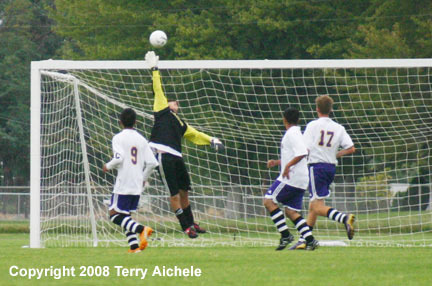 The Hermiston goalie is stretched out like a superhero in flight in an attempt to block or deflect a Mountain View shot on goal. Unfortunately the ball slipped past the goalie for a goal. 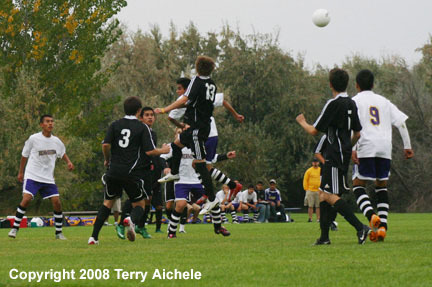 HERMISTON - The Dawgs played the Cougars on a gray afternoon that included a slight drizzle. Mountain View scored first in the eighth minute. The Cougars scored again in the 24th minute off a shot from the left side of the box after the goalie was faked out of position. The Cougars took the 2-0 into halftime. The Cougars came out ready to dominate the Dawgs in the second half. Mountain View scored the first goal of the second half just three minutes in. This gave them a 3-0 lead. Three minutes later the Cougars scored on a crossing shot the right side of the goal. The Cougars scored again in the 18th minute to take a 5-0 lead. The Cougars swarmed the box in the 27th minute and chipped a shot over the reach of the Hermiston goalie for the 6-0 lead. In the 36th minute a Cougar drove the ball into the net for the 7-0 lead. 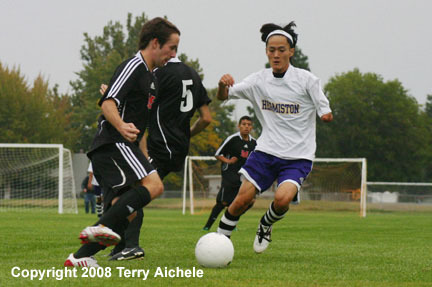 Finally in the 39th minute Hermiston knocked in a goal. LEFT - The Mountain View Cougars had a strong defense that cut off a lot of Bulldogs passes. 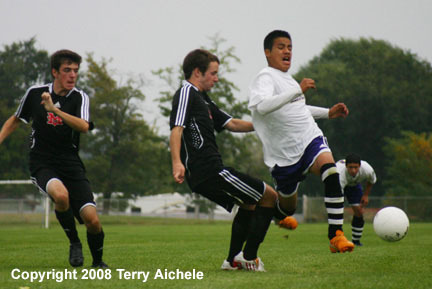 RIGHT - A Hermiston forward drives towards the Cougar zone. 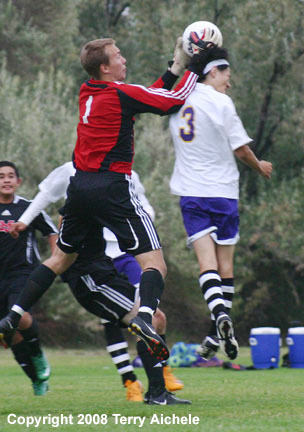 LEFT - The Mountain View goalie goes up to take the ball away from a Hermiston forward. RIGHT - Two Cougars break up a pass to a Hermiston player. 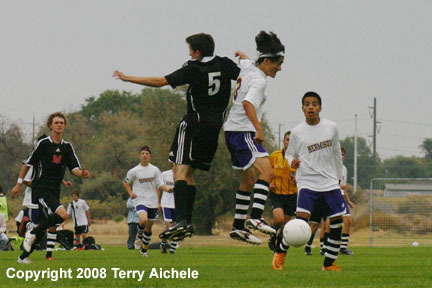 LEFT - It was a pretty physical game that Mountain View brought to Hermiston. 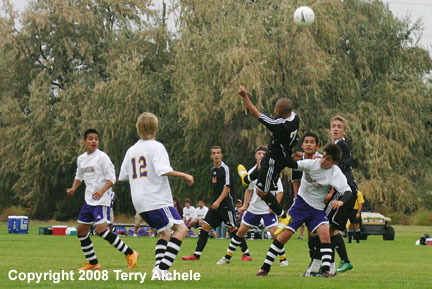 RIGHT - The ball flies away from players battling for header.